When I first thought about sharing this particular guilty secret I was a bit worried. There are already quite a few aspects of my life that people who know me might think are a bit odd but would confessing that I have recently discovered colouring in be one step too far? One of the reasons I thought this was a conversation I had with a friend recently who knew nothing of my new desire to re-explore this childhood nostalgic activity. She told me she had heard someone on the radio being interviewed about his love of colouring in and she obviously thought this was a bit strange. Little did she know that with my birthday approaching I had items on my wish list which would soon add me to the ranks of adult ‘colour inners’. 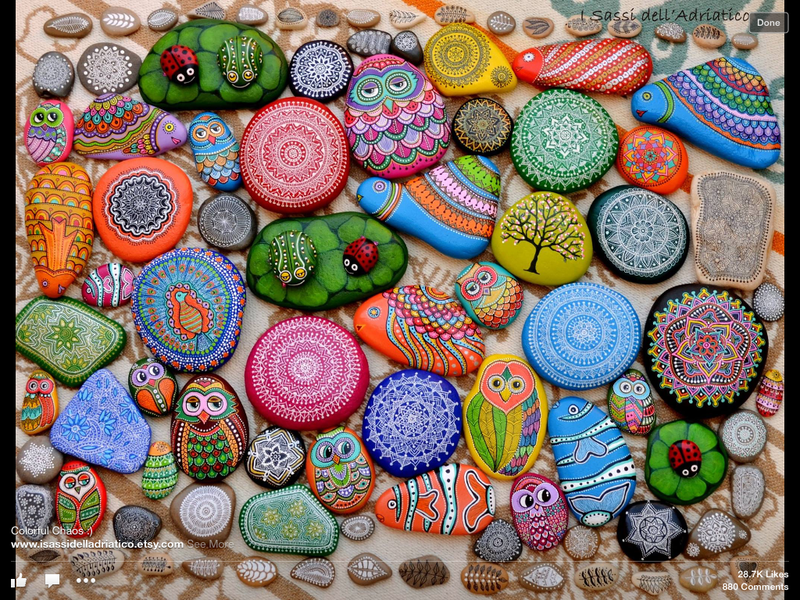 You see I had initially been inspired by a lady in Italy who draws amazing things on stones. Under the name I Sassi dell’Adriatico she produces some stunning pieces. 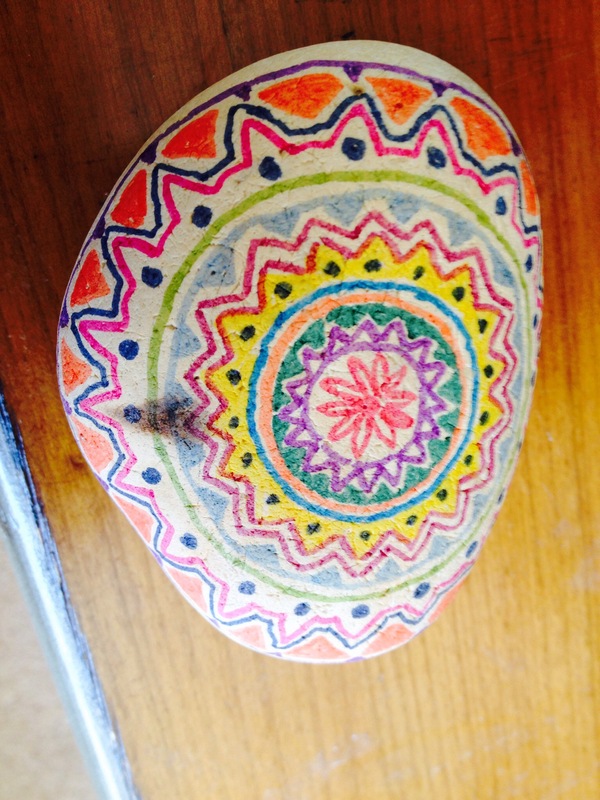 So I found a big stone lying around at home. It’s one of those things that I tend to collect and I decided to have a go. But I felt that a simpler approach might suit me more. 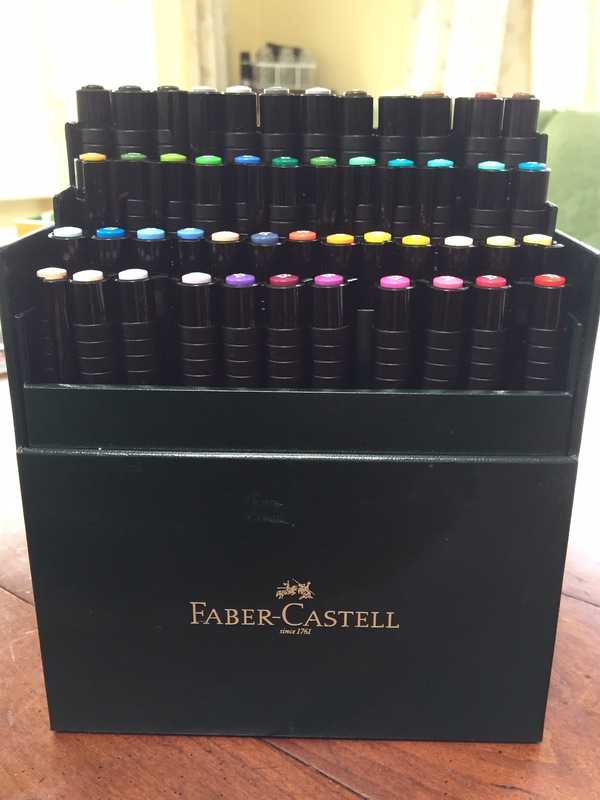 So my wish list included some proper artists pens and my first colouring in book in quite some years. 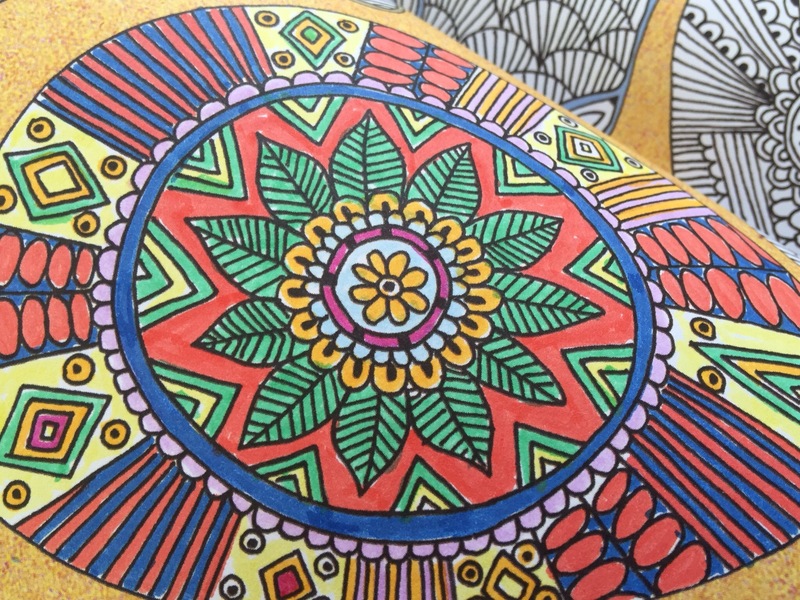 I had plumped for Creative Therapy – an anti stress colouring book by Hannah Davies. I can’t say I have spent long hours in colouring heaven just yet but what I have done I’ve really enjoyed enormously. There’s something about looking at all those glorious colours and choosing the exact one. Deciding to go vibrant or muted. Creating a system for your colouring or really going free range. I suppose it has much in common with creating a garden. Choosing which colours will marry up happily with others. It’s a simple decision making process and it doesn’t really matter if you get it wrong you can always just turn to another page and utilise your new found knowledge to do better next time. Of course not going over the lines is the only self imposed rule which I don’t always manage to follow. I now find rather like bee keeping or almond milk drinking I have joined a growing movement of adults who like to colour in, maybe while drinking their almond milk and before tending to their bees. It’s a bit disappointing to be part of a fad but I won’t let it put me off. Two of the top ten books on Amazon turn out to be colouring books, Millie Marotta’s Animal Kingdom comes in at No. 2 and Richard Merritt’s The Art Therapy Colouring Book comes in at No. 7. I might be adding them to my wish list some day soon. Would love to see any pics Clara.